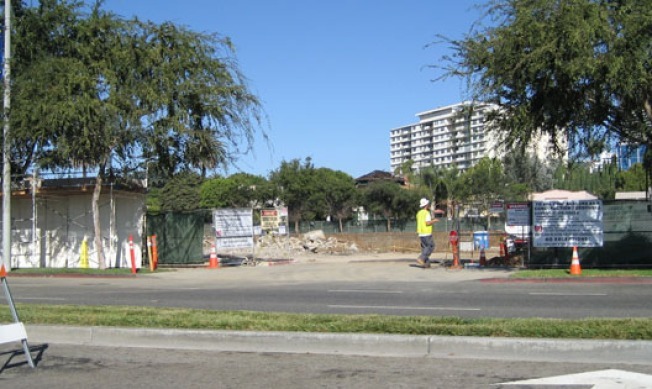 WEST HOLLYWOOD: A week ago, the West Hollywood Pavilions at 8969 Santa Monica Boulevard—which will be reopening in 2009—was half gone. Today, a tipster sends in photos. Ah, circle of grocery store life. Also, we hear there was crazy mark-down at the end, ie, household products and frozen goods selling for dirt cheap. LITTLE TOKYO: Some sort of uhm, interesting designs are kicking around for that Little Tokyo Shopping Center at 3rd and Alameda that's getting a makeover. This is the latest look. If we remember correctly, this is the mall that was purchased by Koreans, who plan to kick out all those Japanese businesses, right? LOS ANGELES: Hey, Racked LA is doing TV recaps! Of "Project Runway," of course. "Of late, Kenley has stolen the show—this week by getting sexed up by Jerell a la Britney Spears (and seeming to like it), being generally clueless about anything hip hop related, and, once again, getting defensive with the judges." But making hip hop seems hard.